Large old trees are among the largest and longest-living organisms on earth. They occupy a revered position in the human psyche, appearing often in iconography, art, books, films, and other cultural expressions . Large old trees also play key ecological and ecosystem roles, having major influences on hydrological regimes, nutrient cycles, disturbance regimes, and the distribution and abundance of populations of their own and other species . Evolutionary and physiological advantages of being large and old include outcompeting other trees for light, water and nutrients, as well as high and prolonged levels of reproductive output. While large old trees have been the subject of many scientific studies, we argue that significant challenges thwart progress in researching and conserving them. These include the lack of an agreed definition, problems in understanding and predicting their distribution and abundance, and the wide span of spatial and temporal scales involved in conserving their populations. 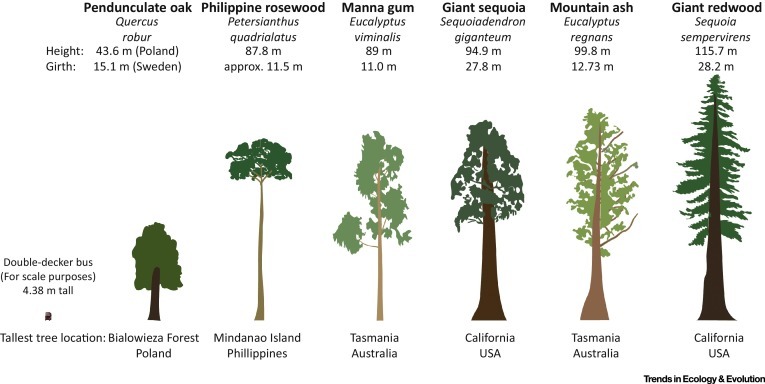 An initial conundrum is simply defining large old trees, as the features that characterize them vary greatly among species and ecosystems (Figure 1). Beyond extreme age, height, and girth, large old trees have key attributes not characteristic of young trees, large or small. These can include extensive buttressing, numerous cavities, expansive and vertically heterogeneous crowns, and large lateral branches. Such traits vary both among and within species, with the latter being influenced by local site conditions as well as a tree’s disturbance history, growth form, and other factors including its genotype. Using age-specific criteria to define old trees is hindered by the great difficulty of acquiring reliable age data for entire tree populations or multiple species. We therefore suggest that large old trees be defined operationally, on a species- and ecosystem-specific basis, based on their relative size. This involves (i) establishing the typical minimum diameter of reproductively mature (flowering and fruiting) individuals, and (ii) defining ‘large’ trees as being above a certain percentile (e.g., the top 5% by diameter) of all reproductive trees. A weakness of this approach is that the largest individuals of a tree species are not always the oldest, but otherwise it should be tractable to define large and generally older trees for any particular species and ecosystem type. The distribution of large old trees is often the result of interacting natural and human influences that act over multiple spatial and temporal scales. Understanding these factors is highly relevant for management, such as identifying refugia for large old trees. However, such efforts face at least three interrelated complications. First, different factors influence trees at different stages of their life cycle , with the growth stage of ‘large old trees’ likely occupying a small subset of the overall environmental envelope for a given species. Further, some long-lived tree species may have germinated under markedly different environmental conditions from those that now prevail at a given location, with current conditions possibly being unsuitable for new cohorts of the species. Second, because of past and current land uses, large old trees have often been removed from much of their former distribution . This can create a biased picture of the actual environmental tolerances of a species. Finally, tree distributions can be strongly affected by rare or episodic events such as intense fires or floods, the timing of which can be difficult to predict. Large old trees are susceptible to a plethora of threats, including deforestation, logging, agriculture, drought, fire, windstorms, invasive species, the development of human infrastructure, and climate change. A major challenge is to understand how such varied threats affect different tree life stages and potentially interact in additive, synergistic, or opposing ways. Effectively, conserving large old trees requires a spectrum of management actions from preserving large intact stands of old-growth forest to maintaining single trees within highly modified urban environments. General strategies cannot be applied uncritically, as managing threats to large old trees will require ecosystem-specific actions. For instance, micro-fencing can promote plant regeneration and faunal use around large old trees in Australian agricultural landscapes, yet would reduce habitat suitability for species-rich invertebrate assemblages associated with open areas near large trees in Nordic agro-ecosystems . The competitive advantages of features such as extreme height, which are adaptive in intact habitats, make large old trees particularly susceptible to certain threats. Large trees become thicker and less flexible as they grow, making them particularly vulnerable to wind damage in fragmented landscapes . Extreme adult longevity may mean that the environmental and regeneration niches that older individuals experienced in the past may differ from those at present. This could create inherent lag effects that are destabilizing for population persistence, especially when climatic conditions are changing rapidly. Other potential effects of climate change on large old trees are highly uncertain. Some authors have suggested that rising CO2 levels, which may fertilize trees and thereby increase their growth rates, may create the environmental prerequisites for the development of more large old trees . Others, however, have argued that climate change could negatively affect large trees by increasing droughts or storm intensity  or favoring the proliferation of vines, which are important structural parasites of trees and may be advantaged by storms, drying conditions, and rising CO2 . Indeed, across many ecosystems, competitive interactions with other plants have pushed trees to maximize their growth rates, increasing their water demands for photosynthesis and forcing them to live ‘near the edge’ in terms of their vulnerability to droughts . This raises a conundrum: if trees are already near the physiological limits of their drought tolerance, how can large old trees persist in a world that has long been beset by droughts? As CO2 levels continue to rise, the water-use efficiency of plants is expected to increase (because they do not need to leave their stomata open as long to take in CO2 for photosynthesis, and thereby transpire less water), but whether this will simply be offset by accelerated plant growth is unknown. Because of such complexities, the impacts of climatic change and changing atmospheric chemistry on large old trees remain highly uncertain . Beyond tackling individual and multiple threats, the conservation of large old trees will demand innovative approaches to management over unprecedented timeframes. For example, traditional broad-scale actions such as conserving old-growth forests will rarely apply in desert, savanna, agricultural, and urban environments where many large old trees occur as individual stems or small clusters of trees. Small-scale or even individual tree-level conservation will be needed. At landscape scales, a priority will be protecting the locales where large old trees are most likely to develop and persist. One obvious example is mesic refugia, given the narrow hydraulic margins that large old trees apparently need to survive . The pace and diversity of contemporary environmental changes is likely to pose unique challenges and vexing decisions for conserving long-lived species such as large old trees. For instance, assisted colonization to new, previously unoccupied locations may be required for large old trees. This, in turn, could create novel ecosystems  in which large old trees become part of new species assemblages. The notion of devising management and monitoring strategies for species that can live for many centuries or millennia is an enormous challenge (for instance, the longest environmental monitoring program globally, running for ∼170 years at Rothamsted Research, West Common, Harpenden AL5 2JQ, UK, is brief in comparison). Yet such thinking is essential to protect existing trees and ensure successful recruitment of new cohorts. Clearly, safeguarding large old trees will demand new kinds of perspectives and action for conservation managers. It’s not like Washington is listening to California now on any issue. There is a fair argument that Washington is not listening to anyone outside of direct contributors. Perhaps California’s Governor Brown should consider himself a political contributor and demand the same respect – and fealty – as the Super PACs.